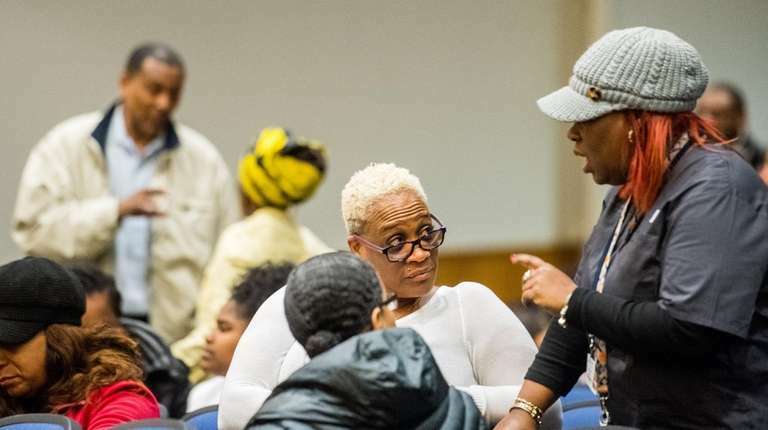 More than 150 people attended the special meeting Wednesday to air their feelings about the disturbing images found last week in a middle school classroom. More than 150 concerned parents, community members and lawmakers attended a special meeting of the Roosevelt school board Wednesday to express their outrage and learn more about the image of two nooses that was displayed as part of a photographic collage in a middle school classroom. Winnie Espada, who lives in the district, has a son who is a senior at Roosevelt High School and two children who graduated from the system. She said she was "very offended" when she saw the image. "I know all the teachers. I've been in the district for 17 years, so I was very alarmed," she said. One of the three teachers who was suspended in connection with the collage has worked with her children, Espada said. "One of my kids is saying, 'She's a nice teacher' . . . but this is not tolerated . . . [anywhere]. I want her to be reprimanded for what she did, so it can be a symbol of the Roosevelt community not tolerating, or the board, the district, we won't tolerate this. Not here. It's a school full of minorities." Images of the collage, shared widely on social media and by news outlets, sparked outrage from members of the Roosevelt community and elsewhere. Multiple news agencies attended the meeting Wednesday. The incident is being investigated, and three middle school teachers have been placed on paid administrative leave, administrators said Monday. The race and names of the teachers have not been disclosed. Hazelton said the district was alerted to the collage Feb. 6 by a teacher. The district then took immediate action and by Friday had launched an investigation into the matter, she said. Monday she addressed the entire middle school staff and met with students who may be involved, Hazelton said. The district has not issued information on who created the collage, how it came to be in the classroom, and whether students had seen it during school hours. District leaders at the meeting said they couldn't release details because it was a personnel matter being investigated. They advised the public to attend future board meetings for updates. Antares Wendler-Phillips, 52, of Roosevelt said she had one daughter graduate from the district in 2006 and has another daughter in the sixth grade. Wendler-Phillips and several other attendees called for the district to provide diversity and sensitivity training. “I don’t care if you mop the floor or teach in the classroom, you need to know what you’re dealing with," she said. Catherine B. New has lived in Roosevelt for 61 years and said she heard about the collage from a number of news outlets. She wanted to attend the meeting to ensure the community is heard. "A noose has a very heavy meaning in black communities, and not only that, it should be in white [communities] as well," said New, who is black. "Every teacher who comes into a black community to teach should be sensitive to the community she is in as well as the children." New has two great-grandchildren at the high school and one great-grandson at the middle school who was taught by one of the teachers who was suspended. "He said, 'Yes, they’re nice teachers.' I said, 'Fine, that’s good,' but I did explain to him what the noose meant and it’s not something that you just put on the wall and say this is the new bracelet, necklace or whatever the case may be," she said. Historically, the noose has symbolized violence perpetrated against African-Americans, so its image, particularly in a predominantly African-American and Latino community, is considered offensive and insensitive, members of the community and the board have said. Half of the district's more than 3,200 students are Latino, and about 49 percent are African-American, according to state Education Department data for the 2017-18 school year. The middle school, which serves grades seven and eight, has more than 450 students — 55 percent are Latino and nearly 45 percent are African-American, according to the state data. Eighth-grader Briana Diaz, 14 of Roosevelt, had one of the teachers for U.S. History and told the board the teacher is not what some members of the community or media see her as. “My other classmates and I will do anything so that we can get our teachers back,” Diaz said. She said she was shocked when she heard it was one of her teachers — the one who kept her motivated to stay in class and was organizing test prep for Saturdays. “In my mind I knew she is not the type of person who would want to hurt us or show such feelings," Diaz said. The photo of the nooses in the collage was from an internet meme with the phrase “back to school necklaces,” which carries a connotation of suicide. 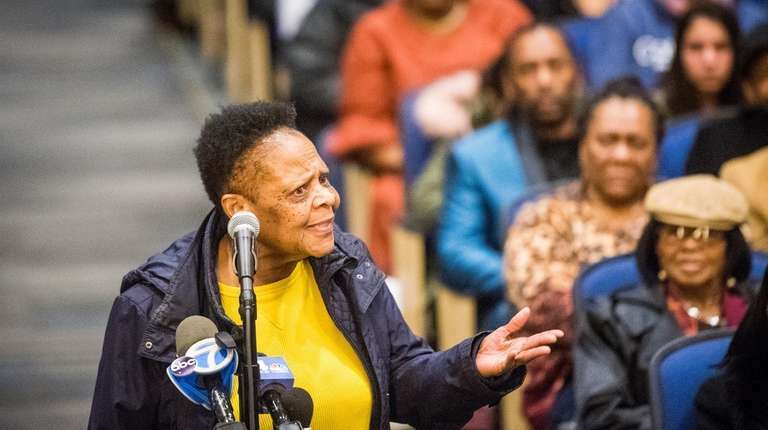 Darlene Allen of Uniondale, who is originally from Roosevelt and runs a foundation in the community, said she attended the meeting Wednesday to get more information. "I felt that it was wrong what the teachers did," she said. "I wanted to come and actually hear a little bit more as to what occurred, because I don’t want to pin my opinion on anyone. But yes, if they did do what they said they did, they should be punished." State Education Department officials said Monday they will conduct a review of the district’s policies and protocols to ensure compliance with the state’s anti-bullying legislation, the Dignity for All Students Act. 3 teachers put on leave after noose images foundThe Roosevelt school district is investigating the display of a collage that includes an image of two nooses, labeled "back to school necklaces."